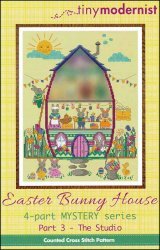 Easter Bunny House Part 3 [W1235] - $3.00 : Yarn Tree, Your wholesale source for cross stitch supplies. Cross stitch pattern from Tiny Modernist. This is part 3 of the 4-part MYSTERY series. Welcome to the "Easter Bunny House!" Beautiful spring flowers are in full bloom along the fence line of the house. Standing on the ladder, with a bucket of paint in one hand & a paint brush in the other, father bunny is applying a fresh coat of paint. Mother bunny is peeking her head out the window, making sure the kids are behaving themselves as they look for Easter eggs. Look at how full their basket is! Upstairs, the other kiddos are enjoying painting Easter eggs. Look at all of the beautiful designs! A hen sits on a box as she lays fresh eggs. The sun is out & only a couple of clouds in the sky, hello Easter! Stitch count is 136W x 179H.